You can enter any life form that lives in the rainforest, such as, amphibians, reptiles, birds, trees and plants, and more! You can also enter photos of rainforests areas, ponds, wildlife in trees and water, or how you feel about climate change, pollution, deforestation, drought, natural habitats, etc… and how you (or all of us) can help the environment. 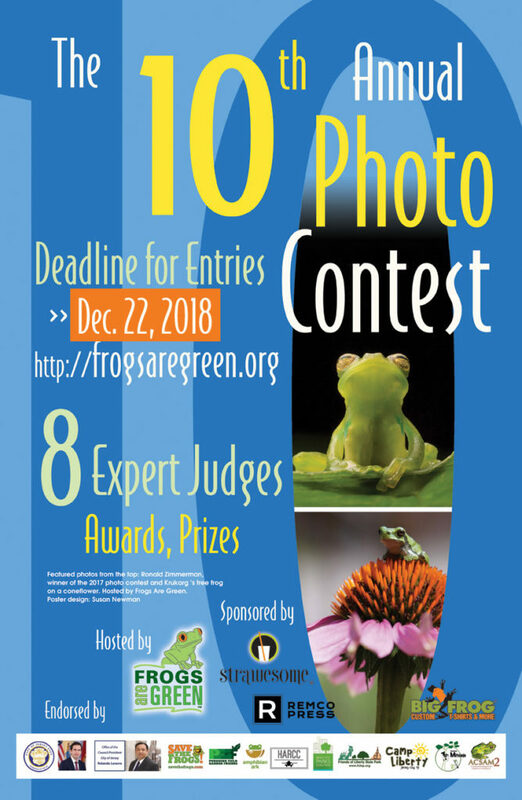 10th annual photo contest hosted by Frogs Are Green. Theme: Saving Life in the Rainforest. We are accepting submissions in one category (this year): Saving Life in the Rainforest. PLEASE! NO photo manipulation and no photos of pets. Please do not move the frog, etc… to get a better photo. Photos of any form of life in the rainforest (frogs, amphibians, birds, insects, etc.) will be accepted. If you cannot view Flickr where you are located, just email your digital entries to Frogs Are Green and we will upload your images to the Flickr group gallery. 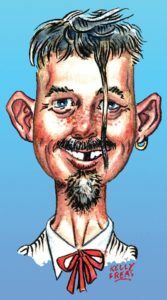 You must share your Full Name and what State or Country you are from or the image was taken. You may also add a caption to help describe or place the image. More than half of the world’s species of plants and animals are found in the rainforest. Rainforests support a very broad array of fauna, including mammals, reptiles, birds and invertebrates. Mammals may include primates, felids and other families. Reptiles include snakes, turtles, chameleons and other families; while birds include such families as vangidae and Cuculidae. Dozens of families of invertebrates are found in rainforests. Fungiare also very common in rainforest areas as they can feed on the decomposing remains of plants and animals. 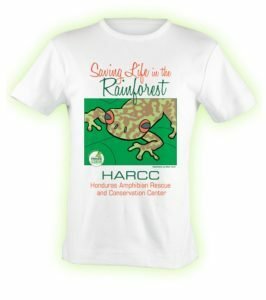 This year we are focusing our efforts on “Saving Life in the Rainforest” for HARCC (Honduras Amphibian Rescue and Conservation Center). 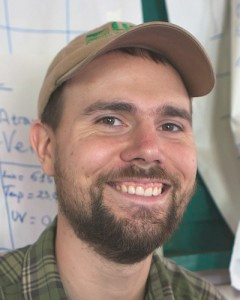 As we launch our annual contest and have attention focused on the Frogs Are Green organization, we’d like to feature the amazing efforts by Jonathan Colby and his team to save three critically endangered frogs. We’ve designed a special t-shirt to raise funds exclusively for HARCC. Our shirts are printed in the USA on cotton and we offer FREE shipping in the USA. Endorsed by: The City of Jersey City and Mayor Steven Fulop, City Council President Rolando Lavarro, Save The Frogs, Pershing Field Garden Friends, Amphibian Ark, HARCC (Honduras), Friends of Liberty State Park, Jersey City Parks Coalition, Camp Liberty, Association Mitsinjo, and ACSAM. The growing list of countries who have participated in the Frogs Are Green annual kids art contest: Australia, Bahrain, Bangladesh, Bulgaria, Canada, China, Croatia, England, Greece, Hungary, India, Indonesia, Iran, Ireland, Japan, Latvia, Malaysia, Morocco, Philippines, Qatar, Romania, Russian Federation, Slovakia, Slovenia, South Africa, South Korea, Sri Lanka, Taiwan, Thailand, Turkey, Ukraine, United Kingdom, United Arab Emirates, and United States. From the time I remember, Art has always been my passion, driving me into a formal education that included my Bachelors in Fine Arts and Masters in History of Arts. My art is a combination of both Fine Arts and crafts. I have developed a style which involves my culture, tradition, aesthetics, emotions and intellect. My works are noted for elegance and attention to detail and I am highly influenced by folk and tribal arts of India- motifs from these reflect consistently in my art. My contact with the indigenous arts and tribal artists of India and exposure to the international exhibitions and workshops has motivated me to paint more and more. As an artist, I am also proficient in the art of henna. It is a body art, temporary tattoo and has a natural stain. I practice it professionally and I feel privileged to be a part of Jersey City art and culture scene. Creating mandalas, henna design inspired paintings, having a tribal or folk motif, painting on items of utility hence making them as utilitarian art are some of my main focusses. 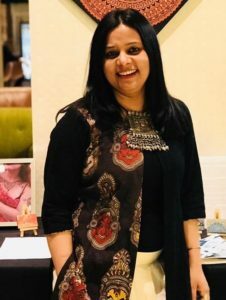 I have held several solo/group exhibitions in the city over the years and been an active participant of the various Art/Craft markets happening across the town. I am a freelance artist based in Jersey City. Painting aquatic life was never my subject but with the Jersey City art program for adopt a catch basin, I got many opportunities to paint several spirits like fishes, mermaids, salamander. 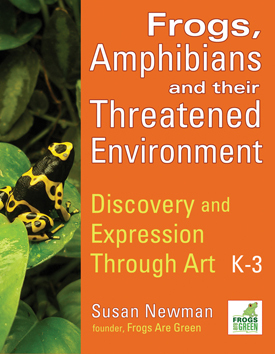 It gave me a chance to hone my skills in this genre where I met Susan Newman of Frogs Are Green. She briefed me all about her organization which is very commendable. It is a matter of complete honor to be as one of the judges for her International contests. May we all be more aware of the frogs in our surroundings. Monica Shaw-Saia studied Political Science with a concentration in Law and International Studies at Manhattanville College in Purchase, NY. 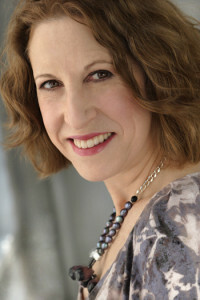 She has worked in many corporate management settings ranging from retail, Law and airline industries. Mrs. Saia is a mother of two children. 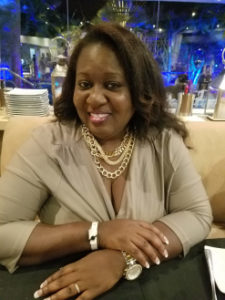 Currently, she is living her dream of helping children and families through the non-profit she co-founded called Deliverance Children’s Ministry, Inc. (DCM). DCM operates out of its headquarters in Atlanta, Georgia and chapters in New York City and New Jersey. Ronald Zimmerman is a biology teacher and wildlife photographer from the Netherlands. He believes in conservation through education. In small steps you can broaden someone’s horizons and improve behaviour towards conserving our own environment. Broadening people’s horizons is also something he pursues in his photography. With attractive images he tries to create understanding and affection for his photographic subjects. Amphibians and reptiles are his mains subjects. This beautiful, but vulnerable, group of animals is harder to understand. They need all the support! I am looking forward seeing your creative work. Let the amphibians and reptiles shine! 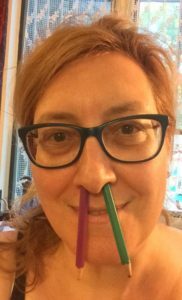 Clizia Gussoni has been working in the licensing, entertainment, and publishing industry since the Pleistocene. Devin Edmonds has been fascinated by frogs and toads since childhood. 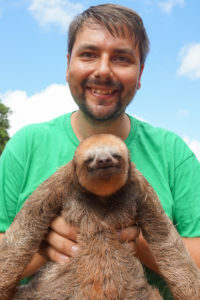 He spent six years in Madagascar to help launch the country’s first conservation breeding facility for amphibians and is now based in Illinois where he enjoys keeping and breeding frogs at home. 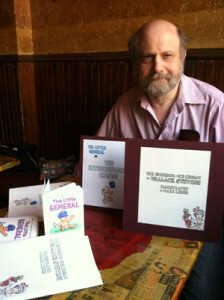 Mark Lerer is an artist who simultaneously inhabits the worlds of cartooning, illustration, and fine art. He holds an M.F.A. from the New York Academy of Art and has exhibited his drawings at New York City’s Nexus Gallery, Broome Street Gallery, Lincoln Center’s Cork Gallery, and New Century Artists. He has also been delighting his Facebook friends with the adventures of The Little General since 2009. 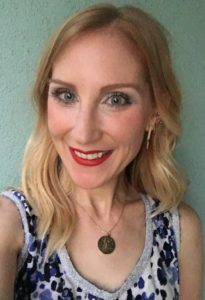 Susan Newman, a Brand Visibility Designer and environmentalist, is the founder of FROGS ARE GREEN and spends her days showing how she feels about the Earth and spreading the awareness that we need to save frogs, amphibians and all wildlife. Susan has donated her design work to various organizations including: Save The Frogs, Parc Mitsinjo, ACSAM (A Conservation Strategy for the Amphibians of Madagascar), Hoboken 9/11 Memorial Committee, Jubilee Center Hoboken for Children, The Central Avenue Special Improvement District, Actors Shakespeare Company, Hudson Theatre Ensemble, and Pennsylvania Women’s Hall of Achievement.